Death is unfortunate part of our lives and holding a funeral is an important way to help deal with the grief of a loved one, to remember them, and to find closure and peace in their passing. It’s important to commemorate the person in the best way possible but planning a funeral can seem like an overwhelming endeavour while grieving. Give Gift Boutique Hong Kong strives to make the selection of funeral flowers, sympathy flowers, coffin flowers, and funeral flower wreaths and stands, an easy and painless process while also providing quality flower arrangements to show your love, remembrance and appreciation for the loved one that has past away. Coffin topper flowers, especially when accompanied with additional flower stands and baskets bring a ray of comfort to the day. Adorning a casket with lilies signifies an innocence and purity of the soul that comes with death. White lilies especially also represent sympathy and are an elegant way to adorn a loved ones coffin. 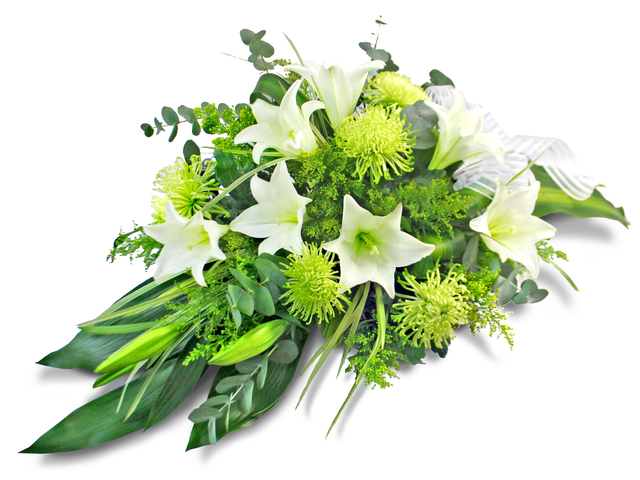 These funeral coffin flowers come with white lilies, green compositae and matching greens. Flower stands offer a grand display of appreciation and remembrance for a loved one. The stands come with the ability to add a large custom message of condolences, love, and remembrance for those in attendance. Flower stands also help with the atmosphere of the funeral in making it more comforting, assuring, and welcoming for those in mourning. 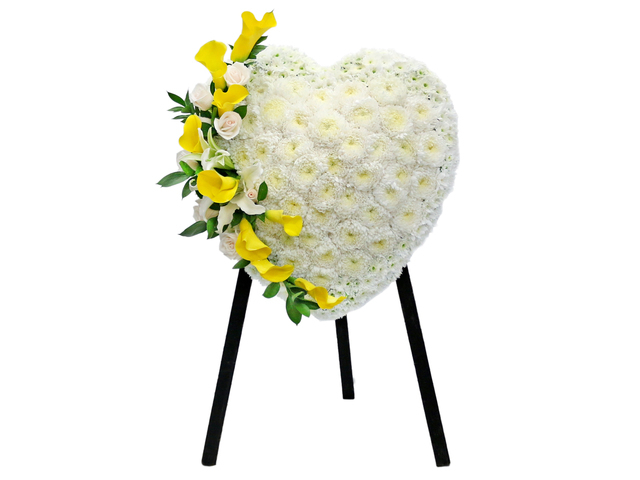 This funeral flower stand offers a unique heart-shaped design made of white daisies and calla and oriental lilies. The message stand can be affixed on top and can be customized to suit your needs. Funeral flower baskets look lovely adorning hallways and entrance ways and they also make thoughtful gifts to send the bereaved as message boards can also be attached to the baskets and can be customized to read the message of your choice. The compact flower basket design on the left contains champagne roses, lilies, dendrobium orchids, matching flowers and stylish greens. The larger flower basket on the right contains and arrangement of lilies, roses, carnations, anthuriums, matching flowers and greens adding a touch of subtle and tasteful colour. Flower wreaths are an important part of death and memorials in many cultures as they represent the circle of life. 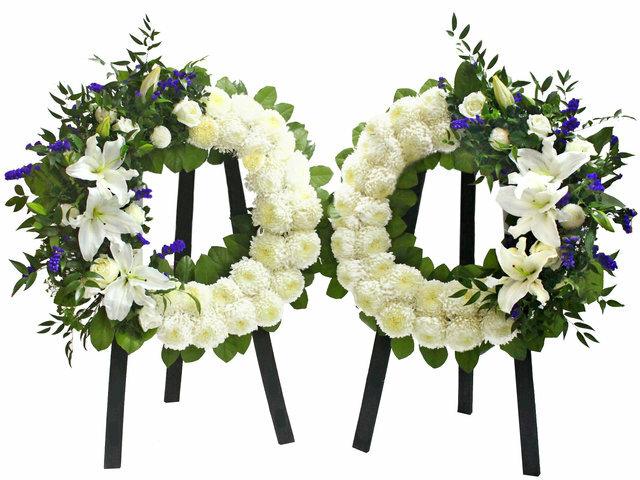 Flower wreaths offer a setting of beauty, formality, respect, and grace that is worthy of your lost loved one. The pair of these two elegant flower wreaths contain cosmos bipinnatus, that make up the shape of the wreath, while white lilies, roses, and forget-me-nots adorn its side. Wreaths such as these look great in pairs but can also be purchased separately. Give Gift Boutique Hong Kong is ready to cater to your needs during times of mourning and will help you find and customize the perfect flower arrangements to commemorate your special loved one. Give Gift Boutique Hong Kong offers timely flower advice as well as rush and same day delivery to help ease your time of grieving. This is a Hong Kong GGB original 'Memorial and Commemorative Funeral Flowers' blogpost.